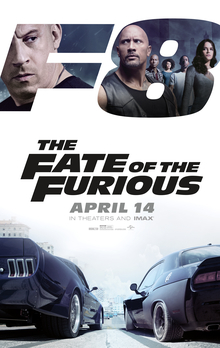 I’ll be honest and admit that this is the first movie in the Fast and the Furious franchise that I’ve ever seen. Sure, I’ve been aware of the franchise for years, but it never really appealed to me (I’m not much of a car guy after all). I got a free digital copy of this movie somewhere along the line and decided I might as well watch it since I own it. I had plenty of preconceived notions about this series based on little tidbits I’d picked up over the years, and pretty much every one of them was confirmed with this movie. I think this movie might be best summed up by one of the lines of dialogue. “What are you, 12?” A lot of the characters’ interactions and dialogue seemed like how a 12-year-old boy who was really into cars would write them. This was especially apparent during Tyrese Gibson’s dialogue, which I assumed was supposed to be funny. The plot itself was so thin that I could practically see the seams that stitched together the big action set pieces. I almost half-expected the camera to pull back and show a 12-year-old playing with toy cars at one point (a la The Lego Movie (2014)). If this movie has any redeeming qualities, it is in the ridiculous nature of these action set pieces. I’ll admit that they were fun to watch, even if the premise for most of them seemed so out there that they’d never be possible. Most of the characters seemed to work pretty well together, too. Even though I did not know their background or previous adventures, I could pick up on the hints, cues, and references they dropped throughout. I might watch this movie again if there’s nothing else to watch, but that’s probably not likely. Flashy and ridiculous action written by a 12-year-old, I give The Fate of the Furious 2.5 stars out of 5.